which are tossed and fall and lie about us in the environment of early childhood. In an idealized memory of childhood, a young boy’s awareness of the world around him blossoms―an awareness of beauty and wonder, but also of death . . . The meeting of a mysterious stranger and a fanciful young woman results in the auspicious birth of a child with the soul of a poet . . .
A submissive youth from a venerable family goes off to school and befriends a kindred spirit, but when war breaks out the two make a fateful decision that will forever change the course of their lives . 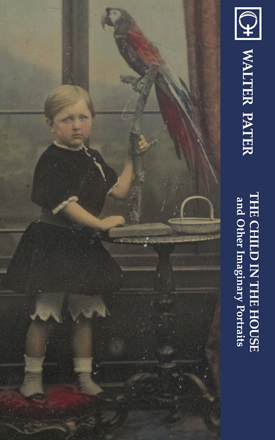 . .
Pater also wrote a series of what he termed “Imaginary Portraits:” a type of literary vignette of his own devising that masterfully blended elements of biography, prose poem, and short story. While most of the Portraits take the form of historical recreations, the three collected in this edition are more contemporary to Pater’s own time and are perhaps the most autobiographical. Previously appearing in the posthumous Miscellaneous Studies (1895), “The Child in	the	House”	and	“Emerald	Uthwart”	are	better	served	thematically in a separate volume. They are reprinted here along	with	a	fragment	entitled	“An	English	Poet,”	a	nearly	forgotten Imaginary	Portrait	which	appears	in	book	form	for	the	first	time. With	regard	to	its	influence,	there	is	strong	evidence	to	suggest	that	“The	Child	in	the	House”	was	a	major―or	quite	possibly	even	indispensable―inspiration	for	Proust	in	his	writing of In Search of Lost Time.